2019 Bennington 20 SLX featuring Midnight Black Panels with Havana Accent Panels complimented with Platinum Simtex Interior. Powered by a 70hp Yamaha 4 stroke. Features Include: Seagrass Beige Flooring, Kicker Speaker Upgrade, Tilt Steering, Starboard Bow Seat Cooler, Battery Switch, Docking Lights, Bimini Top, and Playpen Cover. 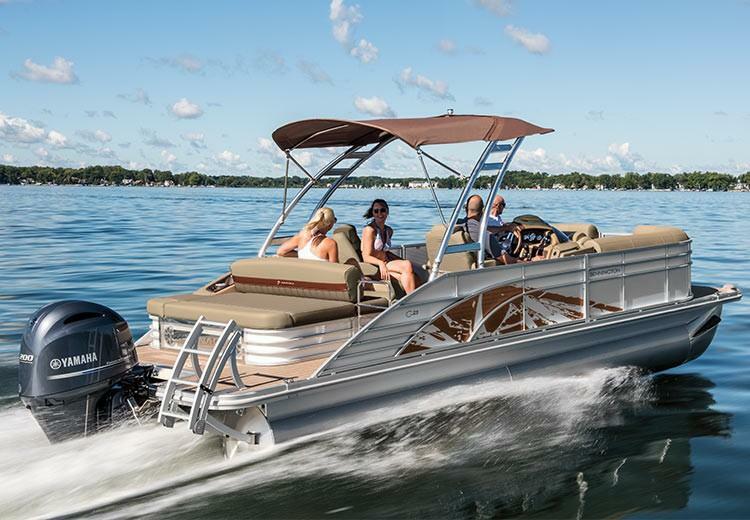 If you?re looking for the best value in boating today, look no further than Bennington SX Series pontoons and tri-toons. Bennington offers enjoyment for everyone, combining comfort, style and function with an affordable price tag. Built in the heart of the Midwest by expert craftsmen, you won?t believe the value for the money. The SX Series is highly customizable with an abundance of options that will allow you to personalize your boat to your lifestyle. Check out the wide variety of stern lounge seating options, fishing features, bimini and camper tops, even an on-board sink!